The World’s Biggest Hollies Fans. Me (on left) and Bruce. I was saddened to hear the news this morning that Bruce Brandt has died. I met him back in 2002 when my wife Pam was kind enough to drive up to Stillwater, Minnesota so she and I could see an outdoor Hollies concert at the town’s annual Lumberjack Days festival. Since The Hollies were going to be performing on a barge on the river, I correctly surmised that we would be able to watch their sound check. When we arrived a good five hours before the concert, we spotted roadies setting up The Hollies’ gear. The area around the stage was empty, except for Bruce, who was sitting in a lawn chair. “I’ve been waiting 30 years to see this band,” he said as we approached. Bruce and I immediately hit it off, swapping Hollies stories, and talking about our separate treks to Minnesota. Bruce had driven all the way from Iowa. We exchanged our email and home address info. When Carl Wayne, the lead vocalist for The Hollies at that time, walked on stage, Bruce, in his exuberant way, yelled a request for an autograph. Amazingly, Carl shrugged, made the long walk off stage and came out to talk to us. A short time later, we watched The Hollies run through their sound check. The concert itself got canceled due to a massive rainstorm, but I later learned that Bruce had decided to follow The Hollies on their short tour, and catch all their other shows. He and Carl became good friends, which of course, was a fan's ultimate dream come true. Bruce himself developed a loyal following when he chronicled his adventures at those Hollies gigs and his friendship with Carl, on a Hollies fan page. A few years later, when Carl passed away from throat cancer, Bruce was devastated. I only saw Bruce one other time, when I met up with him and his wife Beth at Fest For Beatles Fans - Chicago. 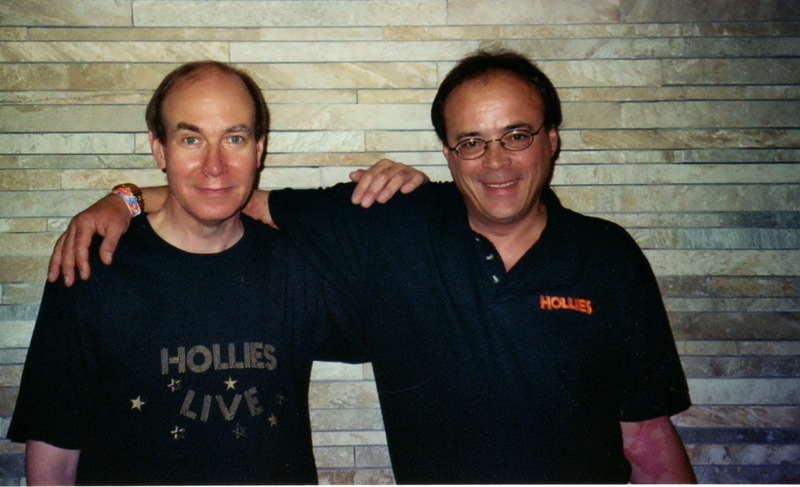 Terry Sylvester, the former Hollies vocalist-guitarist was a guest that year. We had a great time, and I joked that I was going to write an Onion story called World's Two Biggest Hollies Fans Crash Beatles Convention. So here's a toast to Bruce and Carl: Two great guys that I'll always be glad I met.